China Versus Japan: Shooting War, Economic War or War of Words? Are China and Japan Going to War? 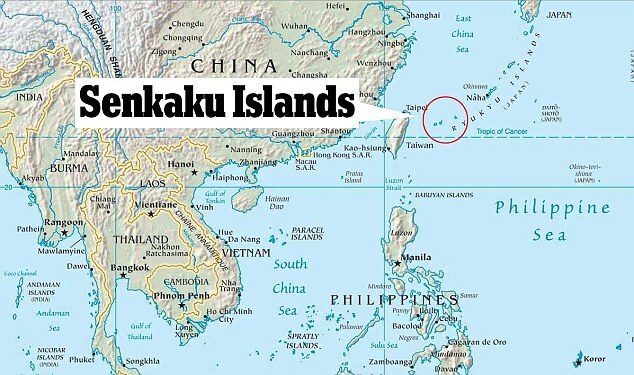 The conflict between China and Japan over a small chain of disputed islands – called “Senkaku” by Japan and “Diaoyu” by China – is fluid. Beijing protesters surrounded the U.S. ambassador to China’s car. They inflicted some damage to his vehicle and briefly prevented it from entering the U.S. Embassy compound in Beijing. The islands are small and uninhabited … so what’s really going on? True, they are in important sea lanes. And the seabed nearby is thought to contain valuable mineral resources. But there are much bigger issues at play. All day long we read how today, on the 81st anniversary of Japan’s invasion of Manchuria, anti-Japan protests flared up in 125 Chinese cities, for the most part peaceful, protesting what China believes is an illegal Japanese attempt at annexation of the Senkaku Islands as a proximal catalyst, but likely also an outlet for years of pent up anti-Japanese sentiment (of which there is plenty on both sides). Steven Clemons, editor-at-large of The Atlantic, says the two nations are probing the other’s weaknesses. “It is really about China testing the United States and its alliance with Japan,” he told RT, adding that he expects the skirmishes to continue for a long time. Indeed, while U.S. SecDef Panetta says that American military focus in Asia are not aimed at containing China, Panetta and other American leaders have previously hinted that any credible economic challenge to the U.S.(from China or elsewhere) will be considered an act of war. Anyone who has 2 brain cells to rub together knows that the “long-game” of U.S. military shenanigans is to contain and weaken China. The U.S. wants to topple Syria’s Assad because he is a close ally with Iran, and the U.S. wants to topple Iran because it is a close ally with China. But what does that have to do with Japan? I spoke with a very smart friend who grew up in China, has lived in the United States for a number of years, and has a very sophisticated view of geopolitics. (He is a professional and an entrepreneur, and isn’t directly affiliated with the Chinese government). He told me that the Chinese and Japanese have periodically argued over these islands, and reminded me that the Chinese people are still furious at Japanese imperial invasion and brutality during WWII, especially Nanking and Manchuria. Most interestingly, he said that the Chinese and Japanese both have upcoming elections, and that they are simply posturing to look tough for domestic consumption. He said that the Chinese and Japanese leadership both know where the “line” is, and that neither will cross the line and actually start a war. From the Beijing’s perspective there will be a major change of leadership coming up at the 18th Party Congress. At this stage the government also doesn’t want to appear as weak. Particularly given the rise of Chinese nationalism. Likewise, Linus Hagström – associate professor of political science and a senior research fellow at the Swedish Institute of International Affairs – says that Japan’s actions are largely driven by political considerations of “not appearing weak”. Currently, China is Japan’s largest trade partner, while Japan is only China’s fourth-largest trade partner. However, the United States is obviously a huge trade partner for China, even if America does end up backing Japan in conflict over the islands. So the one certainty is that there are competing factors and motives involved in the dispute.